Spacious common area for all to enjoy Noble and spacious dining area and kitchen for entertaining Relish meaningful conversations over dinner Very comfortable leather couches for lounging in style This kitchen has a magnificent layout Custom cabinets and Italian quarry marble counter tops Dreamy vaulted ceilings fly above The master bedroom has a dream like feel Step out onto the back deck from the master bedroom Enjoy an evening soaking in the jacuzzi tub The master bathroom has spa like tranquility Peaceful, restful sanctuary Recharge and renew yourself in quiet serenity A cozy yet spacious feel at home vibe Comfortable office desk and chair complete a welcoming work corner Inviting patio offers privacy and shade Enjoy your morning coffee bird watching The yard is a lush sanctuary in the middle of town The house is located only a few miles from dozens of trail-heads Dead Horse State Park located in Cottonwood provides fishing and horseback riding. Near the banks of Oak Creek, tucked beneath towering sycamore, cottonwood and oak trees, rests the garden sanctuary home. The nearly half-acre oasis is completely encircled within stucco brickwork. Apple, pomegranate, nectarine, peach, apricot, persimmon and pear trees offer seasonal rewards. A double hammock, wooden chaise loungers, plush patio furniture, large picnic tables, and an outdoor chimenea add to the enjoyment of the abundant garden. Inside, lofty vaulted ceilings adorned with gracious wood beams soar above. Large windows dominating the southern wall and a kitchen skylight provide abundant natural light while blending the indoor and outdoor spaces. Welcoming cherry wood floors and deep quarry Italian marble counter-tops grace the living space and the thoughtfully equipped kitchen. Beneath the artisanal metal-work chandeliers and high-end art, sits a large solid wood dining room table with leather chairs that comfortably seat eight for any occasion. Creative Leather couches provide cushy seating, while a Danish mid-century console is filled with numerous games for entertainment. The master bedroom and bath offer next level luxury with a spectacular Italian Venini Murano glass chandelier, a regal canopied king-sized bed with marble lamps and nightstands, a Jacuzzi bathtub, glass doored shower, walk in closet, and skylight. The two additional downstairs bedrooms offer quiet respite with soothing ambiance, queen size beds, considerate decor and old-world charm. Full first floor bathroom conveniently serves the guest bedrooms and common areas. The spacious loft features a leather topped desk complete with a printer, relaxing couches built in North Carolina, an armoire with a TV, and a comfortable queen bed and extra mattress stored beneath it. Modern amenities such as LG front load washer, dryer, dishwasher, gas stove, outdoor gas grill, microwave, coffee maker and grinder, ninja blender, Wi-Fi, smart TVs, reverse osmosis water system, pack and play, and thoughtful details throughout the house await you. Additionally, the house is equipped with all major safety features from fire/gas alarms, fire extinguishers, flashlights, and a first aid kit. The house has a new hot water heater, furnace, and evaporate cooler which will keep the house comfortable through all the seasons. The loft has an additional plug in AC unit to ensure a cool temperature. There is a large driveway that will easily accommodate five to six cars. Oak Creek, providing deep swimming holes minutes from the house, flows crisp and cool year-round in the high desert creating an abundantly lush riparian environment. Within a mere mile or two of this garden home resides bountiful hiking and biking trails that lead to spectacular red rock views, an assortment of restaurants, and world class shopping at the famous Tlaquepaque Arts and Shopping Village, Hillside Sedona Shopping Center, shops in Uptown Sedona, and a gorgeous Whole Foods. 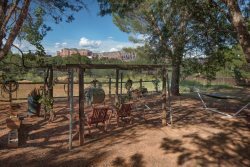 This home is secluded yet central offering spaces to gather and celebrate while still providing the tranquility that is Sedona. We hope you will enjoy our home as much as we do. Awesome Awesome.... I wanna swap properties w the owner I have a place in Hawaii. it was so nice 2 experience True Sedona l!! Gate blocking driveway is not locked, it just needs to be opened. Open by pulling up on the bar and then can pull it out.